GALVESTON, Texas (AP) — To a motorist, zipping south through Galveston County from Houston to Galveston Island, the surrounding landscape might look like a whole lot of nothing — flat land, scrubby grass and frontage roads edging up to open prairie. The Galveston County Daily News reports only the occasional sight of a seabird landing among tall grasses might warrant a glance. Jacob raises a central predicament facing Galveston County as it inherits more and more of the spillover from Houston, creating a population boom that demands more residential developments. Add to that industrial development along the Houston Ship Channel and agricultural land giving way to all types of development. The result, inevitably, is displacement of wetlands — areas of land inundated by water either seasonally or most of the time, including that nondescript prairie, those puddles and that tall grass. Those lands may not look like much to the elevated human eye, but they host critical ecosystems that serve many essential functions in our coastal environment. Jacob and others see gold in the remaining wetlands of Galveston County — prairie pothole and pimple mound complexes on the mainland, brackish marshes on Galveston Island and the Bolivar Peninsula and seagrass marshes along Galveston Bay. Among the services they provide, just by being there, are water filtration, drainage capacity that can often prevent flooding in adjacent areas, habitat for wildlife and breeding grounds for fish and shellfish. For many who long for a life along the water, wetlands are the unseen parts of the land that hold everything else — birds, fish and clean water — in place. But because their value has been historically underestimated and they often are overlooked as important natural resources, wetlands in the county are endangered at a time when we need them most, experts warn. In some areas, wetlands have disappeared at a rate difficult to fathom. As much as 70 percent of seagrasses in salt marshes along Galveston Bay has been lost since the 1950s because of subsidence, sinking land caused by groundwater withdrawal for industrial and residential use, according to the Houston Advanced Research Center, a not-for-profit university consortium oilman George P. Mitchell helped establish as a technology incubator to bridge basic research and market applications. When coastal fringe areas lost elevation along the bay, because of shrinking underground aquifers, the water surface area increased, essentially depriving seagrasses of light and oxygen, thus depleting them. Inland in the county, League City and Dickinson are seeing significant urban expansion and agricultural areas being sold and converted to housing developments, many of them atop remaining freshwater wetlands that are drained, filled in and paved over, reducing the landscape’s natural capacity to mitigate flooding. Forested wetlands, primarily in Clear Creek and Dickinson Bayou, have been inundated with invasive species such as Chinese tallow or privet, inhibiting their natural abilities for drainage and flood protection. Along the lower Galveston Bay watershed, an estimated 3 percent of freshwater wetlands were lost to development between 1992 and 2002, with Harris County, just to the north, losing at least 13 percent of its wetlands in the same period, according to the research center. On Galveston Island, residential developments track right up to the water’s edge on both the bay and beach sides of the island, displacing wetlands and impairing their ability to migrate and replace themselves. None of this is a new phenomenon. The modern Clean Water Act of 1972, the federal government framework for protecting American waters from pollution and, by association, protecting wetlands, changed the pace of that loss and made more people aware of their value in the environment. But with a burgeoning regional population increase, growing development pressures, relative sea level rise — the measure of land subsidence combined with rising seas caused by global climate change — and the White House threatening to weaken federal protections for wetlands, the cumulative impact of wetlands loss in Galveston County has reached what many consider to be a critical tipping point if left unaddressed. When Hurricane Harvey hovered over the Houston-Galveston area for five days in 2017, dropping as much as 50 inches of rain in parts of Galveston County and causing catastrophic flooding, much of that water had no place to go. Thousands of acres of existing wetlands along bayous had long been drained, filled and paved to make way for roads, houses and businesses. Had wetlands been retained, there still would have been considerable flooding but not to the degree that made Harvey a $125 billion disaster, Jacob said. Now, a week doesn’t go by that a municipality in Galveston County doesn’t seek more funding to start a new drainage project or to implement a flood prevention plan, while all around them, wetlands are being sucked up or ignored as a natural part of the solution. What would happen if we succeeded at removing them all? More flooding and less fish, Jacob argues. The worse the water quality, the less fish will breed in area waters. The grasses on those freshwater wetlands clean water through their stems, and they have a biochemical effect on water called denitrification, Jacob said. “They can remove 99 percent of nitrates in the water, and we get a lot of those around here because the rain falling on us is picking them up from the air,” he said. An estimated 98 percent of all commercial fish and shellfish depend upon wetlands in either their life cycle or as part of their food chain, according to the National Oceanic and Atmospheric Administration. In the Galveston area, losing wetlands means losing fish populations that support recreation for humans and enrich businesses and local economies. Regarding flooding, wetlands act as a sponge, trapping and slowly releasing excess floodwaters. 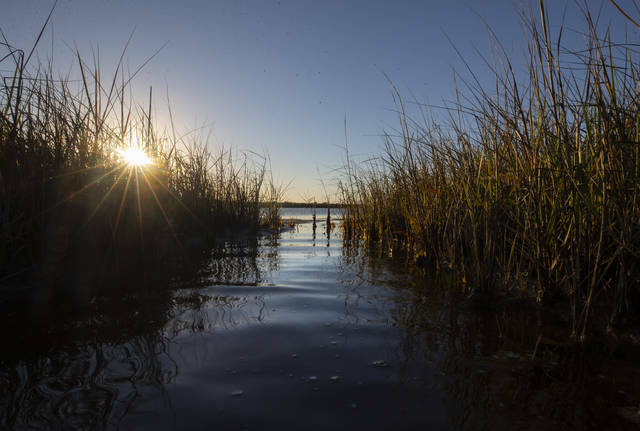 The U.S. Environmental Protection Agency acknowledges this important function in its wetlands factsheet: “Wetlands function as natural sponges that trap and slowly release surface water, rain, snowmelt, groundwater and flood water. Trees, root mats and other wetland vegetation also slow the speed of flood waters and distribute them more slowly over the floodplain. 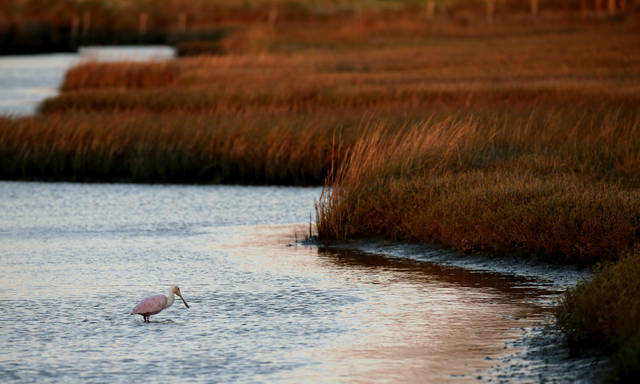 With plans moving forward for a $30 billion coastal spine to protect the Houston-Galveston area from future storm-generated disasters, consideration of the flood mitigation value of existing wetlands ought to be a high priority, experts say. The plan currently being circulated by the U.S. Army Corps of Engineers acknowledges that putting up levees and walls could have an adverse effect on area wetlands and compensates with a provision of millions of dollars for their restoration. Meanwhile, the destruction of wetlands marches on, across the coastal plains all the way to Galveston Island. Sections of the Clean Water Act are under review by the Trump administration, which announced on Dec. 11 it plans to change the definition of “Waters of the United States” to exclude wetlands not adjacent to or connected by surface water to other bodies of water. That would include many freshwater wetlands on the coastal plain in Galveston County. The U.S. Army Corps of Engineers is charged with enforcing existing laws protecting wetlands but doesn’t regulate building on those freshwater wetlands now, adhering instead to a definition of wetlands that lie within floodplains or that have a bed and banks connection, like the marshes along Galveston Bay, Jacob said. Unlike many states, Texas provides no regulations against building on wetlands. 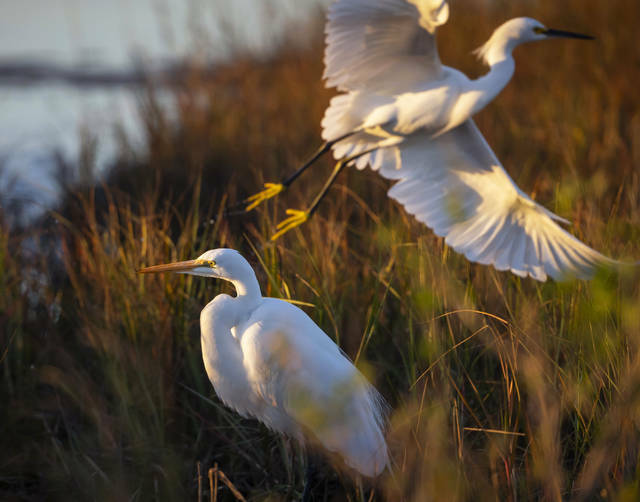 Many wetlands protection activists in the Galveston County area agree that federal support is dwindling for regulation, including providing enough personnel to the corps to keep up with needed wetland mitigation permits, according to the Houston Advanced Research Center. All of this makes the complicated problem of protecting and restoring wetlands even more complicated. “Once you build on a wetland, it’s never going to be the same,” Jacob said. But protecting the wetlands that remain is essential, he said. Disclosure statement: Scott Denning receives funding from the US Department of Energy and NASA. There are three phases, or states, of water: solid ice, liquid water and gaseous water vapor. Even in extremely cold weather, liquid water can’t be colder than the freezing point – about 32 degrees Fahrenheit – so the surface of the ocean is much warmer than the air above it. Some people call the wispy clouds caused by condensation just above the winter ocean or lakes “sea smoke.” That’s a better term than steam. Real steam is very hot water vapor – that is, water in its gas phase, which is invisible. Air can’t rise from the cold winter ground because cold air is dense, so thunder in winter is pretty unusual. Thundersnow happens when really cold air blows in from up north. This cold air is denser than the air at the surface, so it literally falls down, pushing surface air up over the top of it. This can create exactly the same kind of static charge as a summer thunderstorm, and BOOM – thundersnow! This only happens with a really dramatic change in temperature, such as the approach of an Arctic cold front. Saltwater has a lower freezing point than fresh water, which is why we put salt on our streets and sidewalks to melt ice in winter. Seawater is salty enough that it has to get really cold to freeze – around 28 F. It’s pretty unusual for seawater to freeze in the continental United States, though it happens all the time in the Arctic winter. But sometimes when it’s been extremely cold, little ice floes form at the surface of the ocean. Waves break them up, so that the surface can become like a wavy slurpee. For anyone willing to brave the cold, it’s wild to stand by the shore and watch the smoking slushy sea with its slow-motion surf. At the poles, it’s so cold that floating ice crystals eventually converge and solidify into sea ice. The atmosphere on Mars is nearly pure carbon dioxide, which we know as the main greenhouse gas that’s driving climate change here on Earth. But Mars’ atmosphere is much thinner than ours, so it doesn’t trap much heat. On a nice Martian summer day, temperatures can reach 70 F and then fall to minus 100 F the same night. Further out in the solar system, the “ice giant” planets and many of their moons have huge amounts of water and carbon dioxide ice – much larger quantities than all of our oceans. But on Earth, dry ice can’t form above minus 110 F. So there will never be carbon dioxide snow on our planet – just frozen water in all of its many forms. Disclosure statement: Peter Howley does not work for, consult, own shares in or receive funding from any company or organization that would benefit from this article, and has disclosed no relevant affiliations beyond their academic appointment. Partners: University of Leeds provides funding as a founding partner of The Conversation UK. BUDAPEST, Hungary (AP) — Two former executives of an alumina plant in Hungary were convicted and sentenced to prison Monday for an industrial disaster that killed eight people and injured more than 220 in flooded towns and villages, a Hungarian court said. Zoltan B., the former CEO of MAL Zrt., received a prison term of 2 ½ years for public endangerment and other crimes, while Jozsef D., a deputy CEO, received a two-year sentence. On Oct. 4, 2010, a wall of a huge reservoir of the plant collapsed, flooding three towns and villages with about 2 million cubic meters (528 million gallons) of toxic red sludge and water. The court also said the defendants did not notify authorities or were late doing so regarding the sludge flood and its toxicity. The former CEO also made willfully misleading statements about the dangers of the spill, the court found. The amount of water stored in the 25-hectare (61.8-acre) reservoir, over 1 million cubic meters (264 million gallons), was more than twice the limit and its toxicity exceeded the permissible level. In its ruling Monday, the court also faulted poor planning, construction and maintenance of the reservoir.